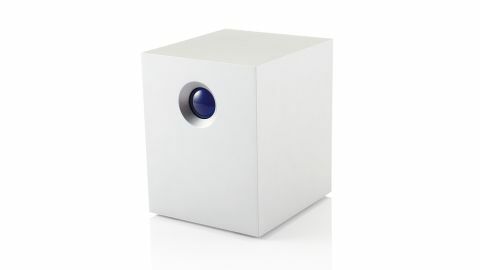 The Lacie 5big drive marries five hard disks in a 20TB volume which, thanks to the capabilities of Thunderbolt, work together at wildly fast speeds. In tests with very small files, the drive performs about as well as Western Digital's two-disk, 10,000rpm Velociraptor Duo. With larger data, the 5big streaks ahead to peaks of 777.7MB/second and 634.9MB/ second in sequential read and write tests. The first figure is near LaCie's quoted 785MB/second, although the second is further below the expected 695MB/second. Hard disk performances fluctuate, but the 5big's average read and write speeds of 569.1MB/second and 490.1MB/second remain respectable. In the tougher random read and write tests, we observed average read and write speeds of 367.8MB/second and 348.9MB/second, respectively. These are within 20MB/second of the peak in these tests, meaning the 5big is more consistent in difficult conditions, and still acceptably fast. The drive uses OS X's software RAID technology, which limits it to basic striped and mirrored configurations. The latter isn't much use unless you want 4TB's worth of data to be stored five times. Look for a drive with a hardware-based RAID controller and more exotic RAID types if you need a better blend of speed, capacity and protection against disk failure. The LaCie 5big offers incredible top speeds and good ones on average, but the price restricts it to pro-level video work.